Coarsely chop the pitted black olives. Put water for pasta on to boil. We will work on the sauce while the water for pasta is boiling. Put a wide shallow frying pan or casserole or wok on medium heat. Add 3 tbsp olive oil to it. Add the finely chopped anchovies. Cook for about 3 minutes, pressing and pushing with a wooden spoon, until the anchovies have almost melted. Add the garlic and dried chilli flakes (or sliced then diced jalapeños). Cook for another minute, stirring occasionally. Going back to the sauce, add the tomatoes, olives and capers. Meanwhile, add salt to the boiling pasta water. Add the spaghetti to cook according to packet instructions. Add salt and pepper and taste the sauce for seasoning. Just before the pasta is ready, remove about a cupful of cooking water, and reserve it. Drain and add the cooked spaghetti to the sauce in your wok or pan. Add a little reserved pasta water, if needed, to help amalgamate the sauce. 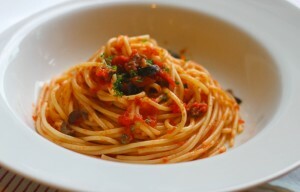 Spaghetti alla puttanesca is ready to be served. Garnish the Spaghetti alla puttanesca with chopped parsley.